Today we drove north to Las Vegas New Mexico to meet up with a member of my Facebook Group Awesome Breastforms. I have been a volunteer with the group for a little over 2 years but this was the first opportunity to meet one of my fellow volunteers in person. Jan suggested a coffee shop on the plaza in Las Vegas which was a great choice for us coffee hounds. We spent a wonderful hour or so visiting and getting to know one another in person. When Jan heard Fred talking about being a fan of the TV show Longmire she walked us down the block to the Sheriff’s Department door that is used for filming the series. Fred at the Durant Sheriff's Department, in Las Vegas New Mexico. Longmire is filmed in this part of New Mexico even though it is set in the fictional town of Durant, Wyoming. Jan gave us a few pointers for finding other film locales and we hugged and said our goodbyes before heading off to Fort Union for the afternoon. Fort Union was established in 1851 and was active for 40 years although the fort itself was built 3 times. The National Monument that we visit today is the last of those established areas. The remnants of the fort cover a large area that included the military post of Fort Union and the Fort Union Quartermaster Depot side by side. Shipments arrived via the Santa Fe trail to be warehoused in Fort Union before distribution to other western forts. Today you can see the exterior walls of the adobe buildings connected by stone sidewalks and laid out in square blocks like a small city. Residential buildings surrounded the parade ground with the laundry, guardhouse and corrals behind them. Offices and storehouses formed another block and the hospital was separate. 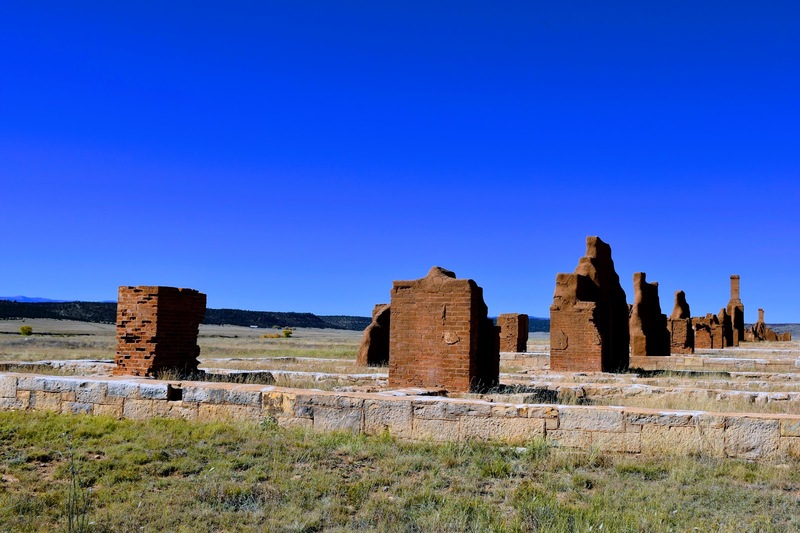 The hospital at Fort Union was considered the best on the western frontier. It’s 6 wards could care for up to 60 patients at a time. Military personal were treated at no cost, civilians paid 50 cents a day. The fort became obsolete by 1979 when the Santa Fe railroad reached Las Vegas and became the commerce route. It was abandoned by 1891. We left Santa Fe early to arrive at the Visitor Center at Valle Caldera by 10. This remote rustic preserve limits backcountry passes to 35/day and we didn’t want to be excluded. The drive was a little peculiar. We thought we had made a wrong turn when we came upon a security checkpoint and had to provide ID to drive through Los Alamos to get there. The views driving up the mountain were spectacular. The roads were narrow with tight switchback turns that made us glad we were driving the Jeep. With our backcountry permit secured we drove into Longmire Country. Valle Caldera is an amazing geologic formation. The preserve is a result of the eruption of a supervolcano 1.25 million years ago. It is a dormant volcanic caldera and remains an active geothermal area with evidence of hot springs and mud pots. The valley that was left when the domes lava flowed away is 13 miles in diameter. It a beautiful landscape of mountain meadows and small recurrent volcanic domes that is home to a large herd of elk. There is a tiny meadow stream that is prized for its brown trout. We saw several fly casters trying their luck in the gently flowing water. The grassland where the herd of elk graze used to be a ranch. The ranch buildings have been maintained as part of the preserve. One of those ranch houses is used to portray Walt Longmire’s home in the TV series. The open grassy areas you see in the background of so many of the Longmire episodes are located in the Valles Caldera National Preserve. Fred was in heaven. He walked up onto Walt’s porch and sat on the steps, then crossed the road to look at the old barn that appears in background in the TV series. The back country permit allowed us access to 22 miles of pothole filled washboarded gravel roads. It was amazing to drive them seeing hillsides of volcanic ash and huge boulders of pumice and obsidian. Driving the caldera was a great way to spend the morning, made even sweeter because it seemed so familiar. The volcanic eruption that formed the Valle Caldera was also responsible for creation of the tuff that makes up the Pajarito Plateau and Frijoles Canyon. Tuff is the rock that is left when hot ash cools. Tuff is porous and soft. It allowed Ancestral Pueblo People to carve into it with hand tools creating cavities in the rock face for shelter. Tuff was also carved into brick shapes used as building blocks for dwellings in front of the cliff face. Bandelier National Monument preserves some of these cliff dwellings that are located on the outer slope of the caldera. The cliff dwellings at Bandelier were occupied between the mid 1200’s to the 1500’s. It is amazing that concrete evidence of their occupation remains recognizable today. We enjoyed walking the Main Loop and Nature trails, climbing ladders to look into the tiny cavattes and spotting petroglyphs carved high on the rocks. Window carved out of the tuff. Petroglyphs. Art or ancient graffitti? Those petroglyphs had us considering the graffiti and tagging of our era. Were Ancestral Pueblo parents annoyed at the defacement of their homes or were the drawings considered art in their own time? Were the drawings and carvings used to tell a story? Are they a means of communication with future generations or the bored doodles of an idle teenager? Bandelier National Monument does a great job of preserving these dwellings and the artifacts that have been found near them.